2300 Broadway St. S.W. on Thursday, early in the afternoon. A federal report from 1984 may contain a clue to the cause of what a neighbor calls the “Broadway Reservoir” in Albany. It shows a drain line from where the localized flooding has appeared this rainy fall on Broadway Street, leading about 300 meters northwest to an outfall on Queen Avenue. I’m no engineer but I know water runs downhill, so if that pipe still worked the water would not pool on both sides and sometimes on the street. 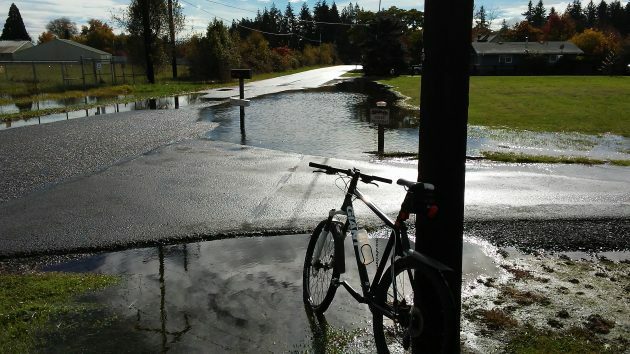 I wrote about this drainage issue on Wednesday because it happened to coincide with the Albany City Council action to form a storm water utility, an instrument that starting next spring will collect a rain tax from water and sewer customers inside the city. On Thursday, there was more water on the street and a nearby driveway than the day before. The water is coming off a vacant grassland that used to be known as the Back Forty of the former U.S. Bureau of Mines, now the Department of Energy’s Albany Research Center. Wednesday’s story drew a comment that included a reference to plutonium as a possible contaminant on the Back Forty. That’s what sent me in search of more info. In 1984, it turns out, a division of the Argonne National Laboratory published a long report of an evaluation of the Albany center under FUSRAP, which stands for Formerly Utilized Med/AEC Sites Remedial Action Program. In summary, the report says, researchers found traces of uranium and thorium in the water and soil, as well as a concentration of plutonium 238 five times background level at the point where a tile field exits the Back Forty. This drain tile system, according to the report, was installed in 1967 by the Soil Conservation Service “for an Albany High School project to reduce the soil moisture and to alleviate the subsurface drainage problem.” There’s no hint why Albany High wanted the federal field drained, but obviously there was no hassle about leaving wetlands alone at the time. A map in the report shows the drain field leading all the water to the place where it is now popping up above ground. That map and another one also show the “main tile drain” crossing Broadway Street and heading off toward the northwest. I was researching the plutonium bit to figure out if there was a historic connection to Hanford operations, so I asked a former Bureau of Mines chemist (who was employed during the time of the remediation efforts) why Pu238 would’ve been present. He said it was the first he’d ever heard of it. Choked more than a little at the line about plutonium 238 at a multiple of background. Since it’s not a naturally occurring element. there shouldn’t be a baseline. Did this area ever drain? If so fix the failure. Nice reporting Hasso. Thanks as always. I’m very much in favor of the city making its storm drains work properly. But I’m also very much in favor of government living within their budget. Before they ask (and let’s hope they follow the law and put it to a vote of the people) for more tax money, let them examine the budget and make cuts elsewhere to find the money for this project. Remember what’s happened to our water/sewer rate in the last ten years: it’s increased tremendously. Unlimited government is the bane of our republic. Well now the city has only had 34 years to digest that report. Maybe they just need a little more time to hire some friends and family engineering firms to verify that water does indeed run downhill. You can’t jump to conclusions like that based on one report now can you?